Journey of Hope is a gallery of more than 100 stunning quilts inspired by President Obama’s path to the White House. The works range from the poignantly abstract to the grippingly realistic and feature techniques including piecing, painting, appliqué, embroidery, dyeing, beading, and more. 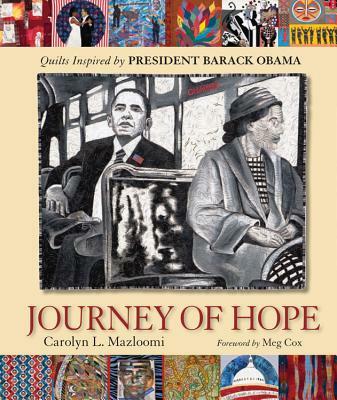 Filled with the spirit of renewal and change that fueled the Obama campaign, Journey of Hope is a celebration of our patchwork heritage and the quilter’s art. Dr. Carolyn Mazloomi is one of the world\u2019s most influential African American quilt historians and quilting artists. Her quilts are in numerous important collections, including the Smithsonian, and she has been featured on programs such as The Today Show and CBS Sunday Morning. Dr. Mazloomi is the founder of the Women of Color Quilters Network, a major force in fostering quiltmaking in the African American community, and she has curated many museum exhibits. Her current exhibit, \u201cTextural Rhythms: Constructing the Jazz Tradition: Contemporary African American Quilts,\u201d can be seen at the American Folk Art Museum in New York. She lives in West Chester, Ohio.Dr. Carolyn Mazloomi is one of the world's most influential African American quilt historians and quilting artists. Her quilts are in numerous important collections, including the Smithsonian, and she has been featured on programs such as The Today Show and CBS Sunday Morning. Dr. Mazloomi is the founder of the Women of Color Quilters Network, a major force in fostering quiltmaking in the African American community, and she has curated many museum exhibits. Her current exhibit, "Textural Rhythms: Constructing the Jazz Tradition: Contemporary African American Quilts," can be seen at the American Folk Art Museum in New York. She lives in West Chester, Ohio.